This topic describes how to create private script with BAS (https://bablosoft.com/shop/BrowserAutomationStudio). Only premium users can do that, to be a premium user - buy BASPremium. Private scripts are always protected, this means that you can be sure, that unauthorized user won't use your software. You also can be sure, that source code of your script won't be exposed. License of your users can be suspended by you at any time from shop admin panel. First of all you have to create script itself. Please download BAS(https://bablosoft.com/shop/BrowserAutomationStudio) to do that. Next step is to create account on this page(https://bablosoft.com/register). You also need to buy premium BASPremium. Visit Script page(https://bablosoft.com/bas/scripts) and add new script. Fill following form It is very important to check “Is private” checkbox and remember your script name as shown on screenshot. As long as your script is private, description is not important and can be random text. Now you need to upload YourScript.xml file created with BAS. Do this with one of following buttons: . 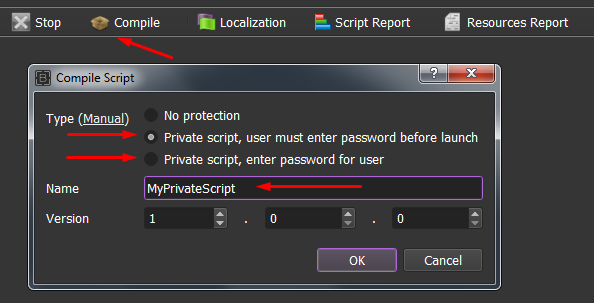 Private script doesn't need any approval, you can start using it immediately. Go to the next tab - Users(https://bablosoft.com/bas/users) to create a user for your script. 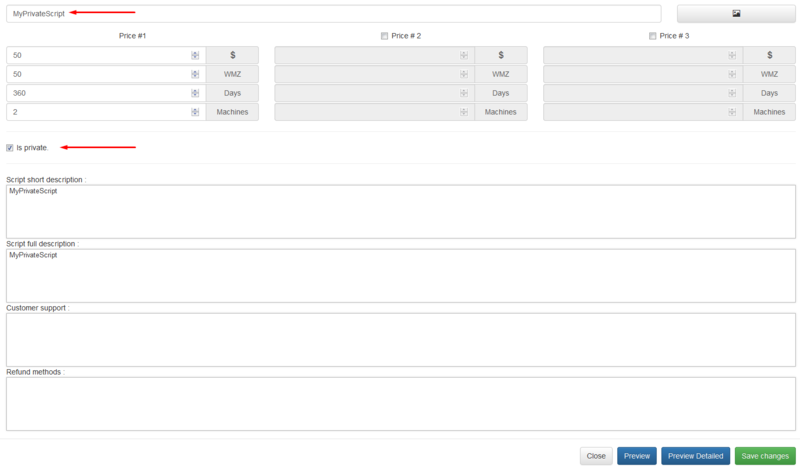 With this buttons you can create user and give him your private script. Remember user login and password. Finnal stage is to compile script. This is done with BAS compile button and you have 2 options here: compile script with or without password. Scripts with password means that user must input it on a first run, but you can send same distributive for all user. Script without password means that you input password instead of user and it won't be necessary for user too input it, but you must create personal distro for each user. One more note: name of script must be the same as you entered it on “Script” page. If you created distro with password protection you can create more and more users on admin panel and give access to them giving them the same distro. Number of your users is unlimited. And shop doesn't take any fee. Login and password that client need to enter(or which is entered by you) must be the same as on Users tab. Another advantage of private scripts is automatic updates. When you upload new version of your script in Script tab, all your users will receive update.